We have a great selection of BuyNow trucks and machinery, which means that you can buy a truck for a fixed price on the spot - directly off the Turners website. 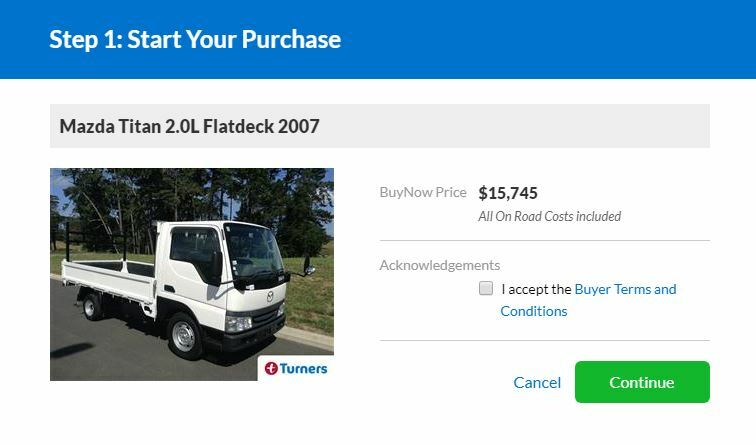 Many trucks due for auction also have a BuyNow price. Getting your asset If you’ve bought the truck or machine online you’ll receive a confirmation email and one of our staff will be in touch. If you’ve bought the truck or machine in person our consultant will take care of the sale and have you behind the wheel in no time! Create an account with us! It's quick, easy and you get lots of helpful tools. More information here. The next screen will ask you to accept the Buyer Terms and Conditions. To read this document click on the blue link. Next you will be asked to confirm your purchase. The deposit you need to pay will be displayed on the screen. this amount will be deducted from the credit card you have registered to your account, as below (up to $500). Press "use this card" if you wish to finalise the purchase with the registered credit card, or "continue with a new card" if you wish to change the credit card registered to your account. You will be taken to a screen where you can enter in your credit card details as below and complete the deposit. Once the deposit payment is successful you will be taken to the next screen - and congratulations on your new purchase! You will receive two emails regarding your deposit and balance. If you have further questions, you may find the answer in our frequently asked questions. Looking for a particular truck or machine? If you’re interested in receiving email alerts about a particular type of BuyNow truck or machine, you can set up a saved search from your Turners website account. Simply click here to find out how.